Snow-covered roads, high winds and ice were creating dangerous driving conditions from Missouri to Delaware on Sunday ahead of a “polar vortex” that’ll bring below-zero temperatures not seen in years to much of the nation in the coming days, likely setting records. Several states in the Midwest were being walloped with up to a foot of new snow, and residents shoveled out and stocked up on groceries before bitterly cold temperatures set in overnight. Five to 7 inches fell overnight in the Chicago area, while 8 to 10 inches was expected to fall in central Illinois, Indiana and Michigan on Sunday, National Weather Service meteorologist Ed Fenelon said. Forecasts also called for several inches in western Tennessee and 1 to 3 inches in Kentucky. The vortex, a counterclockwise-rotating pool of cold, dense air, will affect more than half of the continental U.S. starting Sunday and into Monday and Tuesday, with wind chill warnings stretching from Montana to Alabama. With it comes a startling forecast: 25 below zero in Fargo, N.D., minus 31 in International Falls, Minn., and 15 below in Indianapolis and Chicago. In Chicago, temperatures were expected to fall throughout Sunday to about 11 degrees by 5 p.m., “and from there it will be a free fall for the rest of the night,” with temperatures bottoming out around minus 15 overnight and likely setting a daily record, Fenelon said. The biting temperatures already pushed into northern states Sunday morning. The National Weather Service reported temperatures in the 20-below range in northern Minnesota and Grand Forks, N.D. The coldest wind chill in Minnesota was minus 50 in Flag Island. In St. Louis, grocery stores sold out of the essentials before Sunday’s weather onslaught. Travel problems started early Sunday. In New York City, a plane from Toronto landed at Kennedy International Airport and then slid into snow on a taxiway. No one was hurt, though the airport temporarily suspended operations for domestic and international flights because of icy runways. Flights resumed around 10 a.m. EST. 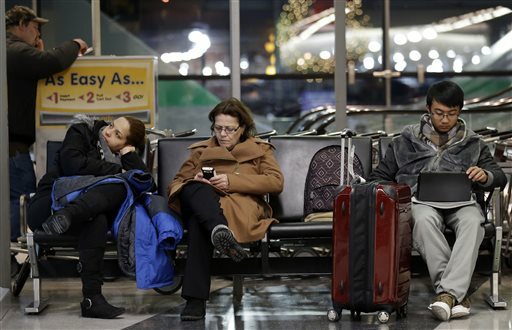 About 1,200 flights had been cancelled Sunday morning at O’Hare and Midway international airports in Chicago, aviation officials said. Mike Duell, with flight-tracking website FlightAware.com, said Saturday to expect delays and flight cancellations because of the cold temperatures. Roads in Missouri, Indiana, Illinois and elsewhere were dangerous. Officials in Missouri warned that it was too cold for rock salt to be very effective. It hasn’t been this cold for almost two decades in many parts of the country. Because of that, medical experts are reminding people that frostbite and hypothermia can set in quickly at 15 to 30 below zero, and it’s key to be dressed for the temperatures. Southern states are bracing for possible record temperatures, too. Meteorologists in central and north Georgia say temperatures could drop into the single digits by Tuesday, accompanied by wind chills as low as 15 below zero. Officials in Alabama said the cold temperatures – in the single digits – could negatively impact exposed vegetation and livestock. Elsewhere, Minnesota has called off school Monday for the entire state – the first time in 17 years – as well as the Wisconsin cities of Milwaukee and Madison. Other places are likely to follow. Sunday’s NFL playoff game in Green Bay’s Lambeau Field could be among one of the coldest ever played: A frigid minus 2 degrees when the Packers and San Francisco 49ers kick off around 3:30 p.m. Doctors suggest fans wear at least three layers and drink warm fluids – not alcohol. Associated Press reporters Jim Salter in St. Louis; Steve Karnowski in Minneapolis; Shelley Adler in Washington; and Brett Barrouquere in Louisville, Ky., contributed to this report.